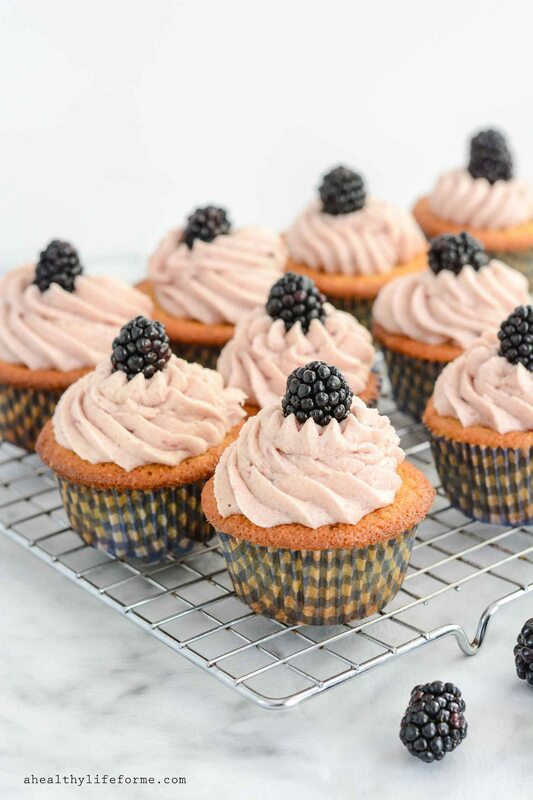 Lemon Blackberry Cupcakes are beautiful moist lemon cupcakes that are topped with a fresh buttercream frosting. 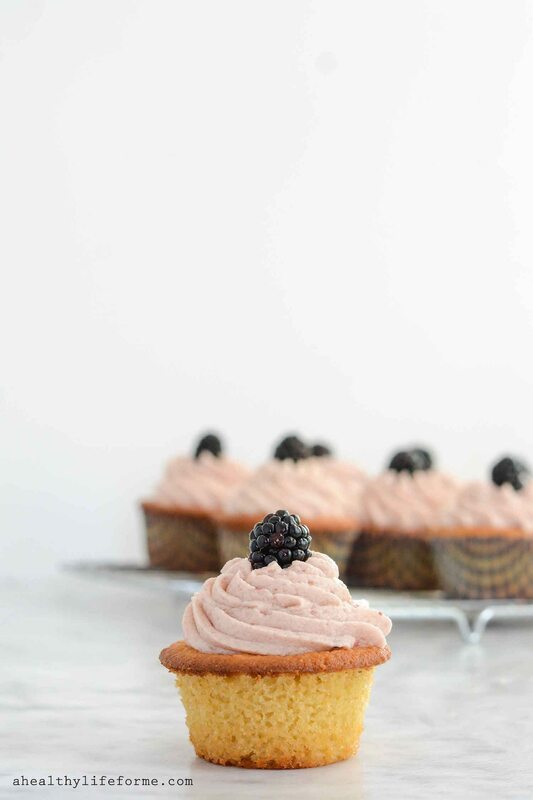 The lemon flavor throughout is the perfect compliment to the fresh blackberry frosting. The perfect dessert to enjoy throughout spring and summer. I hurt by bicep a few weeks ago and the injury has been lingering and not improving, so I have been trying some different forms of therapy to help accelerate the healing. After a few deep tissue massage without much help my massage therapist suggested I try dry needling, and gave me the name of a girl she knew and I thought why not. I talked to a friend of mine who is in the sports industry and he thought it would be beneficial for me to give it a try. When I showed up for my appointment for the dry needling I was expecting a bit of pain from the procedure, but wasn’t too worried. I have a pretty high tolerance for pain and quite honestly I just want my arm to start healing so I figured any discomfort would be worth it. After my evaluation and her explanation I laid down on the table and waited for my first needle. The needle went in, no pain and I thought “what’s the big deal?” That is until she started to move that needle and then “holy crap” I may have shouted a few profanities. It FREAKING hurt. I mean really HURT! After 30 minutes, 25 needles and a lot of shouting and cursing on my end, I was done and I almost ran from the office. My therapist assured me I would feel better in an hour and I would definitely be coming back in for another round. Quite honestly I thought she was on crack. I was pretty uncomfortable for hours after, but by the evening all the discomfort was gone, I was just a bit tender in the muscles she worked. It has been two days and she was right I do feel a LOT of relief in the muscles she worked. I scheduled my second appointment for two weeks from now, and I am hoping my muscles won’t be so tense and the procedure won’t be as painful. After my pain and suffering I thought I deserved a sweet treat and cupcakes always make me a happy girl. I love the fresh berries at the market right now and the blackberries were calling my name, so I grabbed several baskets of the beauties. I knew that I wanted to add fresh blackberries to the frosting and the blackberry puree I made was perfect. Plus I had extra left over that I saved and have been enjoying on top of my yogurt, smoothie and cocktails. The lemon cupcakes are moist and delicious and grain, gluten-free and paleo friendly. Do you enjoy using fresh berries in your desserts or using them in puree? Lemon Blackberry Cupcakes are beautiful moist lemon cupcakes that are topped with a fresh buttercream frosting. 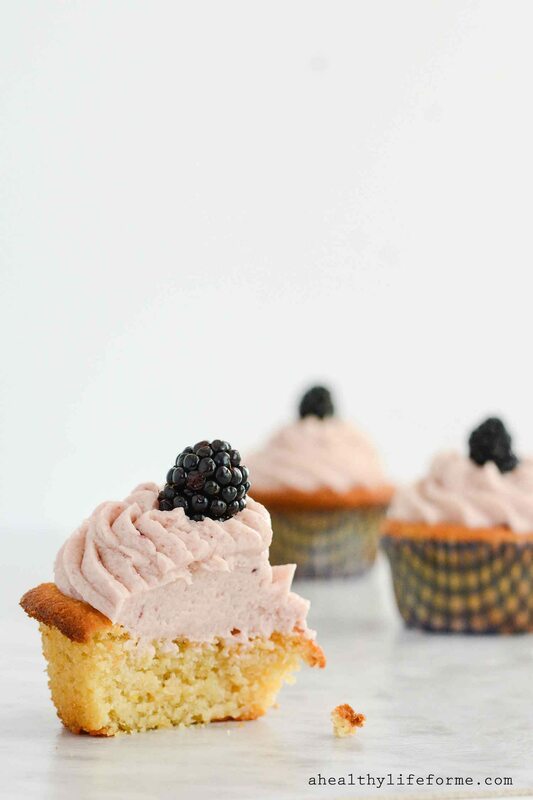 The lemon flavor throughout is the perfect compliment to the fresh blackberry frosting. The perfect dessert to enjoy through out spring and summer. Add the flour mix into the butter mix and stir until *just* combined; do not over mix. The batter will be very thick like pudding. Drop in blackberry puree by tablespoons while mixing on high. Add a single blackberry to frosting. I love seeing fresh blackberries because they are one of my favorite things to eat! I love the combination of the lemon in these cupcakes. These are the perfect sweet treat! I would say you deserve 2 cupcakes after all that! These are so pretty and they sound delicious! So sorry about your bicep! I hope it starts feeling better for you soon. These cupcakes look delicious! These cupcakes are gorgeous!!!! Pinned! These look so good – love the blackberries on top! Smart girl Kacey, and yep these cupcakes did make me feel 100x better! These are so beautiful, I’m loving all the fresh berries coming into season and they look perfect on these cupcakes. Glad to hear you were able to get some relief on your arm! Hope it continues to heal! These look amazing! I love lemon and blackberry together. So pretty (and delicious, I’m sure)! Heidi, No baking soda. I fixed my mistake in the directions. Thanks for pointing it out. Can this be made as one big cake instead of cupcakes? You could make a cake out of the batter, depending on if you do a single or double layer cake you may not have enough frosting. If you want to make a double layer cake I would double the frosting recipe. Coconut cream? The cream at the top of a can of coconut milk? Kristin, Yes, the cream at the top. It looks delicious! What could I substitute the coconut cream for? Hi Diane, Heavy cream would work.